Based on FieldTac - on a smaller scale - Hinderer’s design, the ZT0180 is a product designed for tactical use, even hard uses, in all environments. In addition, this smaller version to the original FieldTac, the Zero Tolerance's model presents other differences: it hasn't the finger choil for the advanced grip, it has a slightly different conformation of the handle and, finally, it employs another steel compared to CPM S35VN used by Hinderer. In fact, the blade of the ZT0180, a sort of modified clip point 107 mm long and 4.8 mm thick on ricasso, is made of Vanadis 4 Extra Uddeholm's steel, produced by powder metallurgy. This material is an excellent choice for the harder applications, as it combines an excellent wear and chipping resistance, with good toughness and an incredible edge retention. In addition to having a good machinability, it is very suitable for coating; in the specific case the knife was subjected to DLC treatment. The blade spine has been lightened and reduced in thickness with an extended swedge without, however, weakening the tip, which appears extremely robust. Furthermore on the blade spine, near the handle, there is a practical and not aggressive jimping; the instrument is also equipped with a small single guard, sufficient to ensure safety during use. The full tang knife, with overall length of 23.5 cm, is equipped with a massive G10 scales with rough surface, fixed to the tang by means of 3 robust Allen screws (male-female) per side. The screws protrude a bit too far from the handle scales profile and in case of prolonged use of the knife, it may be annoying (especially the central one that comes into contact with the palm of the hand), but clearly, for intensive use it is appropriate to use good gloves to overcome this kind of problems. The handle configuration, with more pronounced finger grooves in the initial part and at the bottom, confers a safe and comfortable grip, not to mention that the thickness of the handle is such to fit well in the hand. The scales are pretty squared, but bevels practiced on their profile are providential as not to cause trouble when you firmly grasp the instrument. At the bottom of the handle the exposed tang is visible, which acts as glass breaker (or skull crusher), on which there is also the lanyard hole, very useful in this case when it moves back in the position of the hand to have a greater lever. Despite its small size, the handle is comfortable and in spite of the considerable weight of the knife (about 246.6 grams), the feeling with the tool is great. As always when it comes to Zero Tolerance, machining, finishing, and all coupling of the parts are made in a workmanlike manner. 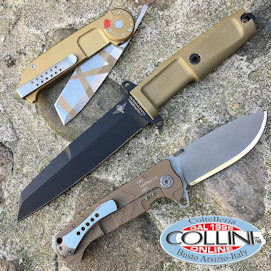 The Mil-Spec USA made sheath supplied with the knife, is produced by Spec-Ops. Brand. Like all the sheaths of this company, this Combat Master Mini version , compatible with the MOLLE system, is made from durable 1000D Cordura and is equipped with a fully adjustable utility / tool pouch, Web loop at bottom for tie-down to packs, leg-loop, belt loop - also equipped with Velcro, a removable insert made of KYDEX®, and retention system on the handle via snap fastener and Velcro. The disadvantage of these sheaths, albeit they are very well made, is the fact that the knife never perfectly fits inside the kydex insert; this problem has been solved in part using a material that can be easily thermoformable in order to confer a better shape around the knife simply by heating it with a heat gun. However, while appreciating the combination of Cordura / Kydex, I would have preferred, instead of this universal sheath, a sheath specifically designed for the ZT0180, principally to have better retention directly on kydex. 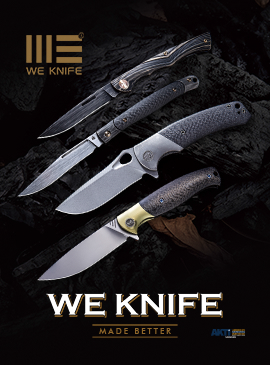 The ZT0180 price list in the US is $ 275, but now you can find it at around $ 220, while in Europe its price is of around € 250.00. The ZT0180, a tactical back-up that aims to be a versatile tool that can operate in any environment, even for the hardest use, has been qualitatively tested by us to evaluate the cutting ability and the tip resistance. On the web it is not difficult to find a destructive testing video in which the knife is mistreated on concrete bricks, and shows how incredible is the strength of steel on the Vanadis 4 Extra; since we believe that this is not an appropriate use of the knife, we tested the product for the most common uses. From the first cutting tests on various materials it is clear that the cutting edge sharpness is outstanding. Also in this case, the Zero Tolerance has been shown to deserve the reputation it enjoys and this brand is, in my opinion, definitely among the forefront of the manufacturers that are able to realize the best factory sharpening. We also tested the tip resistance, stabbing and levering it on laminated wood, and results were more than positive. To put a little more to testing the knife, especially also to evaluating the cutting edge retention, we practiced batoning and chopping on well seasoned acacia wood (therefore very hard). Clearly, given the size and geometry of the blade, it is certainly not the most suitable product for this kind of use, but being a tactical utility knife it must be able to perform almost any task. What was most pressing for us was to mistreat the cutting edge in the shortest possible time, and then evaluate its status by cutting a piece of paper after we have made all these tests. We cannot conceal that there was a lot of enthusiasm when the knife was perfectly capable of cutting a piece of paper as if it had just come out of the box. Even the surface DLC finish, which seemed scratched after tests on very seasoned wood, after a quick cleaning with oil, was back as new. Overall the ZT0180 handling is easy and comfortable, even in grip changes, and the weight - in relation to the overall size of the instrument - helps to make it more effective throughout the uses. Sharpening, cutting edge retention and the overall strength are phenomenal, and the Vanadis 4 Extra goes at the top of our personal list of higher performance steels. Also in this case the slogan "built like a tank" of the prestigious American company, has materialized in a product that retains the initial promise.